The Aussie lightweight prospect has his eyes on bigger fights. Lou DiBella has a nice stable, a real nice stable, topped by Regis Prograis. If you pushed him and made him pick a favorite on the ascent, I do believe he might be picking Aussie prospect George Kambosos Jr, who holds a 16-0 (9 KO) mark. I spoke to the lightweight Kambosos, age 25, who was chief sparring partner for Manny Pacquiao for his last three camps, for the Everlast “Talkbox” podcast. He fought underneath Pacman’s last scrap, and took on Rey Perez. He told me going in he thought Perez would be “tough, he’s no joke, the record (24-10 entering) is deceiving. … I truly believe I have the fastest hands in the game and Perez will find that out in round one.” That he did; Kambosos at the MGM Grand took a UD-8 victory, and after the bout, he told us what was what. ”It was a great fight and statement on such a huge card at the MGM Grand. 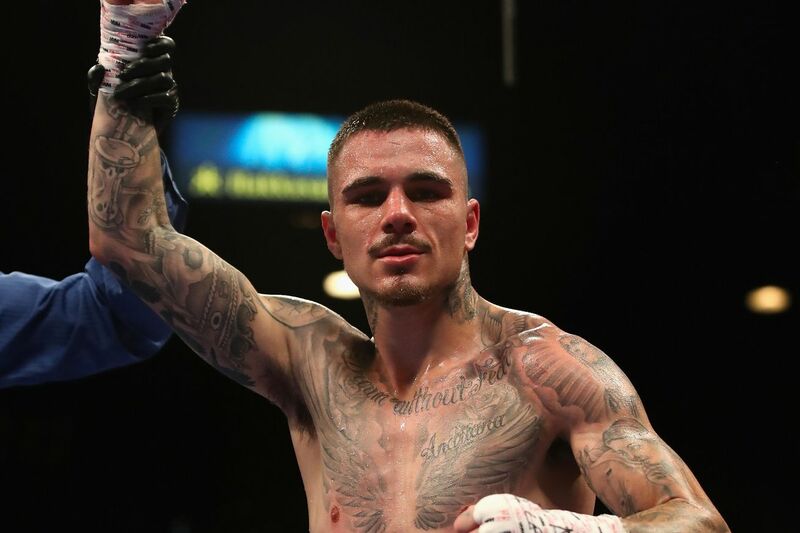 I knew Rey Perez was dangerous coming into this fight and very confident with his last two KO victories being against a world title challenger and world rated contender,” Kambosos told me. “But I stuck to my game plan, listened to my corner and made him feel my speed, power, and accuracy from round one. I broke him down every round and made it a shutout on all three judges’ scorecards. I felt very good in there and showed that I am a serious contender for the title. “I’m looking forward to my next move with my promoter Lou DiBella and I know that I am ready for the 12 round fights where I can really showcase myself over championship rounds. It’s been an exciting journey thus far in the U.S. and I want everyone to know I am here to stay, I’m here to entertain, and I’m here to win the lightweight world title. Kambosos told us he did rugby and was chunky, but he took up boxing and trimmed down. He was 135 at 10. “I was a big, big kid,” he said. So that’s how he found his true calling; and what about how he’s honing the craft? That work with Pacman, what about that? He is trained by Justin Fortune, part of Team Pacman. He was sparring Jose Ramirez and Ray Beltran a few years ago, and Freddie Roach saw that and was impressed. Roach tapped him to train for the Jeff Horn bout. Yeah, they were and are both Aussies. No worries, Kambosos said he was ready for the criticism. The prospect on the cusp of contenderhood said he has loved grooving on the boxing scene in America. He thought Adrien Broner acted the fool at the press conference when he smacked down Al Bernstein, and he thought that Broner wouldn’t even be fighting after Manny had his way with him. Yep, Kambosos was that impressed with Manny’s skill set and sharpness leading up to that most recent fight. And what is in his near and further future at 135, and maybe higher? “Obviously, Lomachenko is the top guy in the division, and that’s the guy we all have our eye on. I truly believe I have the goods to upset him, and get in his head, and produce a great win against him, because in the sparring, the all-time great southpaw that’s Pacquiao, that gets me ready for Loma. He also mentioned the winner of the Feb. 2 Richard Commey-Isa Chaniev fight, which turned out to be Commey. Yep, he sounded ready to lift the belt from either of them. Hey, what about Teofimo Lopez? Final thoughts from Kambosos before he headed off for a workout? Michael Woods, a Park Slope, Brooklyn resident, calls fights for Facebook Fightnight Live, which has drawn over 4 million views over a span of 26 events. FNL runs Friday, Feb. 8 at 7:30 PM ET.